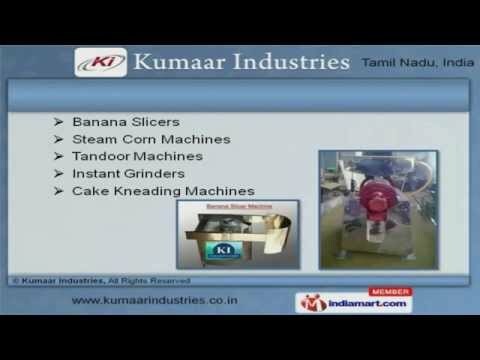 Welcome to Kumaar Industries, Manufacturer and Supplier of Food Processing Machines. The company was established in 1999 at Coimbatore. Our products are applicable in Hospitals, Hostels, Restaurants and others sectors. Experienced R and D department, Flexible payment modes and large production capacity are the reasons behind our success. We offer a wide assortment of Grinder, Vegetable Cutting and Potato Machines. Coconut Scrappers, Oil Dryers and Commercial Mixers offered by us are best in the industry amongst others. Our organization is highly involved in providing an impeccable range of Banana Slicers, Tandoor Machines and Instant Grinders. We have gained tremendous expertise in providing Deep Fryers, Chocolate Fountains and Candy Machines. Our clients can avail from us an exquisite range of Sandwich Grillers, Pizza Ovens and Idli Steamers that are cost effective. Our Gravy, Pulveriser Machines and Popcorn Machine for Wedding Halls are a class apart.